Bohunt School Wokingham has today hosted a special event with Leader of the House of Commons, the Rt Hon Andrea Leadsom MP, and VotesforSchools, a unique voting platform encouraging young people to be more politically engaged. Ms Leadsom visited the school, which is sponsored by Bohunt Education Trust (BET), to take part in a VotesforSchools PSRE lesson with Year 8 students. As part of the session, students debated the question “If you had £50,000, would you set up your own business?”, as well as debating questions around whether its better to go to university or into employment, after finishing sixth form or college. 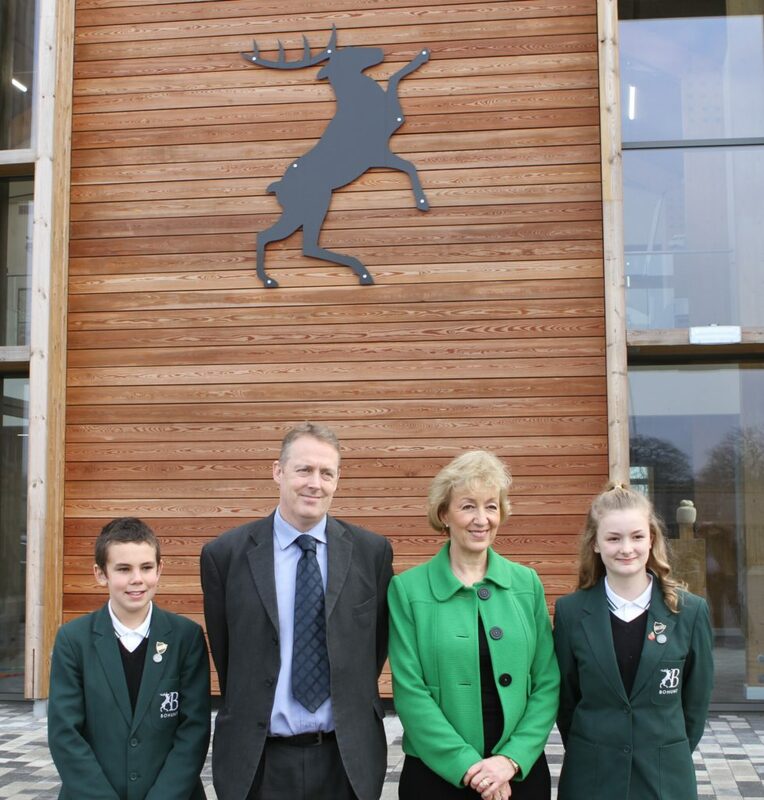 After the session, Head Boy, John Jones and Head Girl, Izzy Snaith, were delighted to give Ms Leadsom a tour of the school, which opened the doors to its brand-new, state-of-the art building, in September 2017. Bohunt School Wokingham and the Trust more widely, are committed to ensuring that all students have access to the skills and opportunities required to succeed as 21st century global citizens. To aid the effectiveness with which this is achieved the school’s innovative digital learning environment enables them to make use of the VotesforSchools platform, which aims to provide young people with a better knowledge of current affairs and democracy, and to encourage them, once 18, to vote. “We were absolutely delighted to have Andrea Leadsom visit the school, meet with students and join the VotesforSchools lesson today. At Bohunt School Wokingham, we pride ourselves on the high-quality, innovative and dynamic approaches to learning that we provide for our students, and today’s debate was another great opportunity for our students to demonstrate the key principles which underpin the school’s educational ethos, and stretch and challenge themselves on big issues relevant to their world and their future.